Taste the delicious fruit of the Garden of Eden in this juicy 5 reel. Snake lot features all your traditional fruit machine symbols; the cherries and the grapes etc. However, this game comes with a twist – Defy the temptation of the evil snake and you could be walking away with huge rewards in this 40 payline biblical classic. Leander’s Game Studio is an independent company whose mission is to deliver innovative game content to market more quickly than current solutions. They offer an outstanding portfolio of games and strive to create high quality video slots with thrilling innovative concepts and features, combined with top quality art and balanced mathematics. 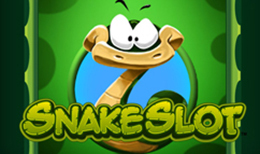 Snake Slot, no messing around here, it's a slot, the theme is snakes and what a colourful, cheerful jaunt it is! We're in the jungle and there are snakes everywhere! However even if you have a phobia, you're gonna love this comical take. It's a visual delight and fun to play. There's a lucky line, a bonus feature and more! The cartoon style graphics set the tone and we have trees either side of the reel panel, wrapped in colourful vines and, in the right tree, a snake lurks. He's harmless looking, sways side to side and a win prompts a nod from him. The jungle spreads around us and the five reels spin on a light back ground allowing the colourful symbols to pop. We have thirty play lines and five reels decorated with Jungle themed symbols including various fruits, melons, grapes and bananas, cherries, lemons and strawberries. In addition, we have a diamond, a crown and a coin, all of which have a snake wrapped round them. The snake is the wild. A second snake symbol triggers the snake lucky bonus line and we have a gold bonus symbol, a gold snake and star, this triggers the Free Spins Feature. And we have a fruit hat wearing snake symbol and this is an invite to a Jungle Party! So, set your line and bets, bets start at 0.30 to 15.00, and we're trekking through the jungle! The Wild subs for all symbols, bar the bonus wild, to create a possible winning combos. The symbol is on reels three, four and five. Land three of them and you'll trigger ten free spins. Further freebies can be triggered and watch reel five during play for the snake lucky line symbol. Land this one and the shutters come down covering the reels leaving just four windows. You also get two extra free spins. It's during this play that your winnings can really escalate! During this play, I racked up an extra 15.30 and on a second trigger, I won 19.25! Lining up three of the bonus symbols triggers a fun bonus game during which the snake slithers down the tree looking for food and it’s your job to provide him with tasty snacks. The play area and buttons are framed in wood and setting options offer plenty control over your play preferences. There is an auto spin button and along the bottom of the reels you can see each win total, your line bet and total bet. I found this a fun slot to play offering some decent wins and a variety of features. The graphics and sound effects work perfectly and bring the theme to life. While comical in presentation, beneath is a hard working slot that has plenty on offer. The comical style of this slot is immediately inviting. I found it a nice, relaxing play with plenty variety and lots on offer. It should cast a wide appeal for ease for play, reasonable bet choices and its potential for some exciting wins.